I know how fun it is to play in Photoshop, creating invitations, cards and all other kinds of DIY design. That’s why I found a way to make this experience even better – I created this awesomely big set of watercolor floral brushes. 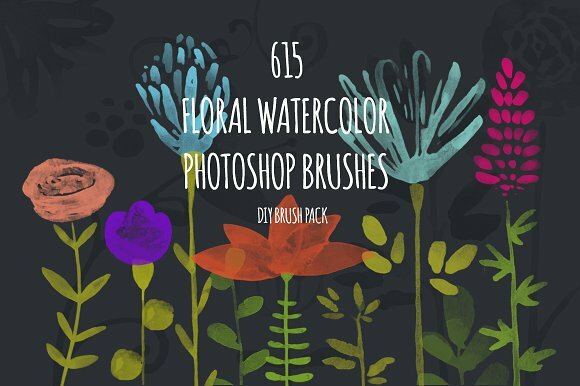 This brush pack contains 615 PS brushes – including flowers, leaves, stems, pistils and bonus – swirls and dots. Can you imagine, how many unique flowers and bouquets you can create by mixing & matching? It’s easy to create your own design in Photoshop using this brushes – just open new document, load brushes, choose color and use brush as a stamp. If you feel stuck at some point, feel free to contact me. There are so many brushes in this set that I had to do 3 full length-previews to fit them all. So please click on small previews and scroll to see all you will get. All of this floral elements were drawn by hand using watercolor and then scanned, edited in Photoshop and converted into PS brushes.